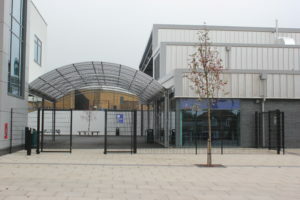 Jacksons Fencing’s wide arsenal of security products includes its welded security mesh panels: EuroGuard®. EuroGuard® comes in a range of different styles all of which have different profiles, designed to accommodate all types of perimeter security applications; Regular, Combi, Extra and Flatform. Regular is ideal for a myriad of applications, from residential areas to commercial properties and schools. In the BRE global guide it achieved an A rating. 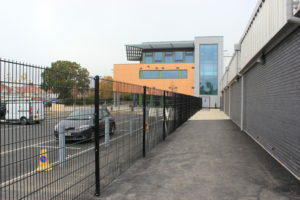 EuroGuard® Combi combines steel wire mesh with pressure treated timber slats to create a perimeter that is aesthetically pleasing, reduces visibility into the site and is secure, as it removes any foot or hand holds. Extra is perfect for when you want to take your security to the next level. It features heavier gauge wires and a smaller mesh apertures, making it ideal for higher risk locations. All EuroGuard® styles (apart from Extra) come with 200x50mm wire centres with a 45mm gap and 5mm wire. Its anti-climb design helps to dissuade potential intruders, and it can be customised for barbed, razor wire or Rota Spike® for enhanced security. It comes with anti-tamper fixings, making it extremely vandal-proof. Extra comes with 200x30mm wire centres with a 25mm gap for advanced protection capabilities. EuroGuard® Flatform SR1 and EuroGuard® Combi SR1 both have LPS 1175 ratings from the Loss Prevention Certification Board (LPCB). Jacksons’ EuroGuard® security mesh is a secure choice for any perimeter security needs. It is easy to install, available in different variations and customisable making it ideal for almost any situation where security is a concern. Its well-engineered design gives it strong security credentials to keep sites and premises safe with the benefit of further enhancement as its fence posts allow for integration with CCTV cameras, lighting or any other mounted physical security device. EuroGuard® comes with a 25 year guarantee ensuring products of the highest quality that will last the test of time.